Cassini spacecraft Rhea - Solar System Planets And Moons Section. Cassini spacecraft took this picture of Rhea. 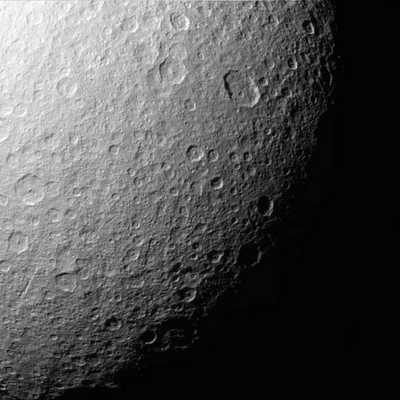 Saturn's moon Rhea at the Southern Pole. NASA's Cassini spacecraft took this picture of Rhea, one of Saturn's moons. The reasonably close view is of the moon's southern polar region which has been extensively cratered during its long history. Cassini acquired this view on July 14, 2005 when it made a close flyby, passing only 239,000 km (149,000 miles) away from the moon. The large, well-defined oval-shaped crater on the upper right is approximately 115 km (71 miles) across. Predicting Times for Clear Space Weather. When astronauts will be spending more time in space, it'll be helpful to know when there'll be clear "space weather", to minimize their exposure to dangerous amounts of radiation. NASA scientists have developed a better understanding of the underlying causes of solar flares, and think they can now predict times for "clear skies". Areas likely to explode as flares happen when magnetic fields of different alignments merge together on the Sun's surface. Electrical currents must then build up for several hours before a flare erupts.